I wanted a nice apron pattern and found this vintage pattern I liked by Vogue (8643). I have not purchased a Vogue pattern in many years and they were on sale at JoAnns for $3.99. The regular price this pattern was $22.50. At $3.99 it was a stretch for me. Since I haven’t sewn a Vogue pattern in a while I can not speak for other patterns but this one would not be rated for a beginner. There are curves that are a little tricky and sewing on the side panels takes a little fussing. 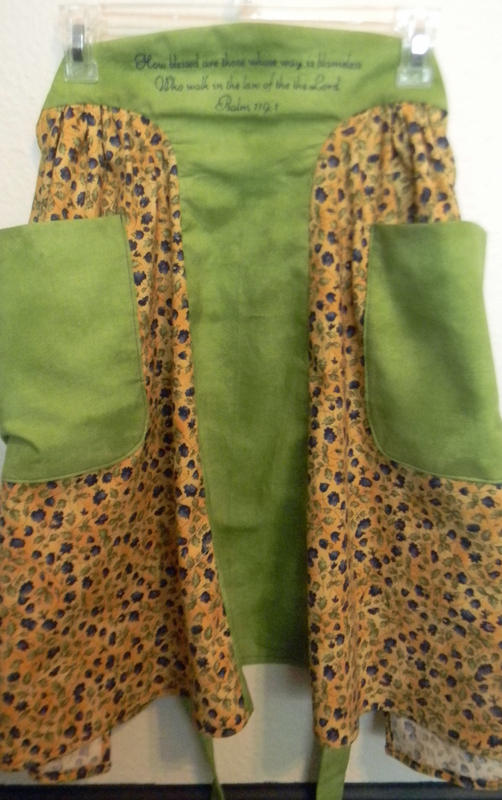 I chose a fabric I had in my stash for the patterned fabric and purchased a green to match, both cottons which I pre-washed. I wanted to embroider a bible verse and did that in a navy. I used approx. 1 yard of the printed fabric and 1 yard of the green and sewed a size small. I chose view B. When sewing on the facing it says to sew an additional seam close to the original seam and them trim close to that seam. I was going to use a zig-zag but decided on more of an edge finish stitch and then I cut close to that. I also used this on the front seams. 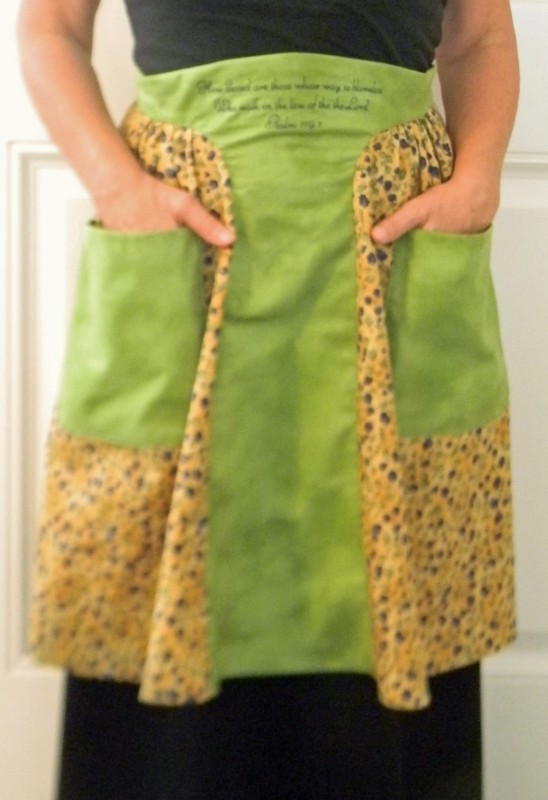 I don’t think the pictures do this apron justice. It turned out very nice and I will be donating it to Nana’s House Children’s Home for their bowling fundraiser. They will also have drawings and a bake sale. This entry was posted in Apron, Posts, Sewing and tagged Apron, Embroiderd Apron, Embroidery, sewing, Vogue 8643. Bookmark the permalink.